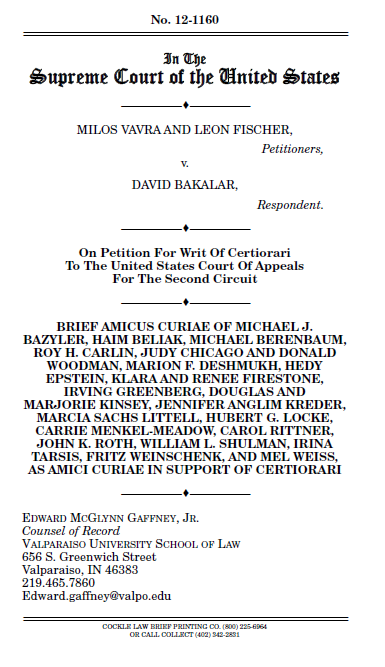 Proffessor Edward Gaffney of Valparaiso University recently submitted a Brief Amicus Curiae on behalf of numerous scholars in support of Certiorari in the Bakalar v. Vavra case. To read the Amicus Brief, click here! 8:00 -8:30am Registration and Continental Breakfast (All attendees must check in upon arrival. A removable jacket or sweater is recommended). Please return this form to Georgia Lawyers for the Arts, Inc. In this panel discussion, attorneys whose practices focus on art law will speak on issues of repatriation and restitution -- specifically, how the legal process of returning looted works of art to their countries of origin is informed by the works' genre and surrounding cultural norms. The discussion will follow the legal system's treatment of looted art from various eras, including Antiquity, the Second World War, and the more recent Cuban Revolution.